Larger labs will require several Pouring Jigs. As shown in this picture, the Impression Index-Plates are lined up in a row with the impression in front and the cellophane sheets behind. The technician will pour as many as possible per bowl of plaster until all are done. With practice, the plaster indexes for the impressions take very little time and are usually completed before starting the align and pour process. 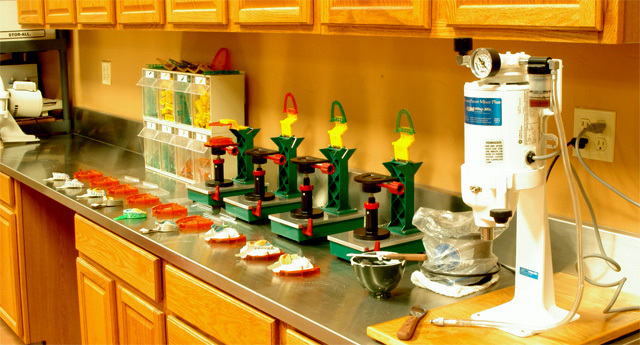 You receive six (6) Impression Index-Plates along with all of the other necessary parts with each Pouring Jig. So, if you have four (4) Pouring Jigs you will have a total of twenty four (24) Impression Index-Plates (of course you can order extra as needed). A model department with gifted technicians will need a minimum of four (4) Pouring Jigs per technician. We know of technicians that require six (6) or more. After a few months using this system, you will be impressed at how easy and fast it really is, but we admit it takes a little practice and being organized is a must. We can not over emphasize the need for organizing the parts when using this system... For information on organization refer to the Home Page under section entitled "Using the System," and go to "Organization of Parts."